I'll be chatting about the trailer for the upcoming "Jurassic World" trailer, which apparently we will be seeing on Thanksgiving. For now, let's talk about this little gem that started it all. Science has given us many valuable things, from fire to the IPad. I remain constantly astonished by what we are able to do, and I look on with a sense of wonder to the possibilities that lay before us. I would never think that scientist would ever want to begin harvesting and breeding animals, let alone prehistoric animals, let alone dinosaurs. But hey, that is why we have movie magic, so we don't have to do this in real life. I was a young boy when "Jurassic Park" came out. But you can bet that I remember hearing people talk about it. You can also bet that the VHS ended up in my family's collection as soon as the opportunity resented itself. Besides maybe "Schindler's List," "Jurassic Park" was the movie of the year, which was 1993. No other movie generated more buzz and discussion that year than "Jurassic Park." You can bet some movies tried ("Last Action Hero") but all paled in comparison to this movie. What was it about this film that made it stand-out in year that has was hailed as one of the 1990's best years? Each October, I like to watch "Bravo's 100 Scariest Movie Moments," simply because it gets me in the groove of that very special month. When "Jurassic Park" found a place on the list, I remember creature-creator Stan Winston saying that he did not want to make scary dinosaurs, but he wanted to make real dinosaurs. 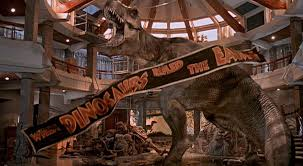 That is the hidden magic of this film, there is a certain spectacle that you expect when sitting down to watch "Jurassic Park" and that is the promise that you will witness dinosaurs, but not just any dinosaurs, realistic dinosaurs. This movie is not a case of putting great special effects into creepy situations, even though it definitely looks that way. This movie was about creating something that felt and looked real, then going from there. Drew McWeeny, a famous movie critic on the blogosphere, has stated that he remembers his early screening of "Jurassic Park" at Universal Studios. He tells us that when the T-Rex first shows itself onscreen, the temperature in the auditorium went up ten degrees. This was due to the fact that everyone was up front, glued to the screen, having an otherworldly reaction to what they were seeing. This movie was groundbreaking for its time, and that still holds up today. Then there is that score by John Williams. If there is one thing that director Steven Spielberg constantly gets correct in all of his movies, good or bad, its matching a perfect song to a scene. This was an epic movie, and it needed an epic score. The wonderfully and beautifully written music by Williams is one of the things that draws the audience into the film. It's not just the dinosaurs that bring us back for more. The music Williams creates only heightens the rest of the emotions that the audience experiences, and it makes for an even better experience. There are great performances by Sam Neill, Laura Dern, Richard Attenborough and Jeff Goldblum, who we follow through this cool story. There is also a nice, snarky, villainous performance by none other than Wayne Knight, who is there to graciously annoy our heroes. The children, played by Ariana Richards and Joseph Mazzello, who further prove that Spielberg was and remains the best director of children. (Just imagine what the Harry Potter franchise would have been like if Spielberg actually directed them.) And, let's not forget, a movie just isn't movie unless Samuel L. Jackson shows up to deliver an outstanding one-liner. More than anything, "Jurassic Park" is great to watch because it is a mixed bag of emotions. Its a movie that will have you clinch up in fear in several moments. It is a movie that will force your jaw to drop in awe of the spectacle. Its a movie that will make you laugh and maybe even make you weep a little. This is a prime definition of the adventure movie, and here's to hoping that "Jurassic World" can follow in this film's big footsteps.